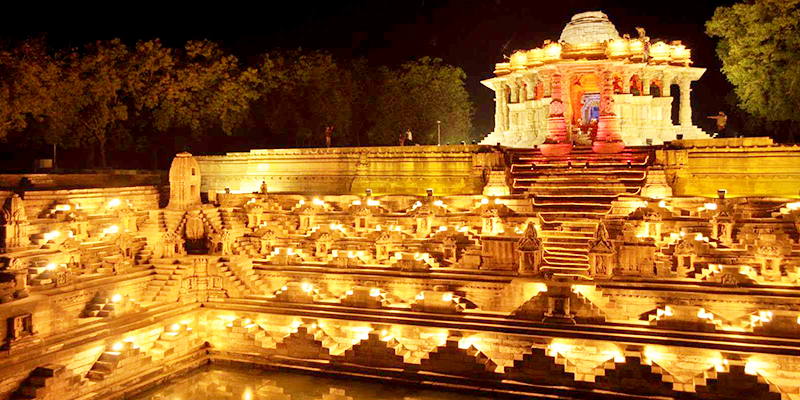 Travelling to revisit the rich Indian History and its royal past is something you will always cherish. Worship of Sun as a God was brought to India from Iran. The two magnificent Sun temples stand in testimony to this fact today – The Sun temple of Modhera in Gujarat and the Sun Temple of Konark in Odisha. 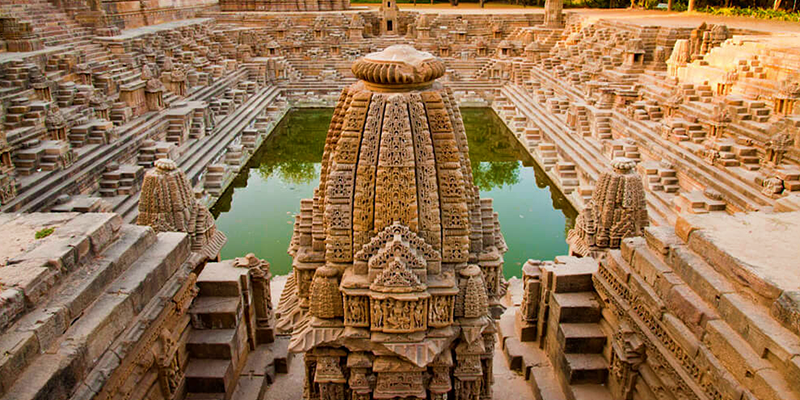 This off-beat Sun temple of Modhera is situated in the Modhera village of Mehsana district. 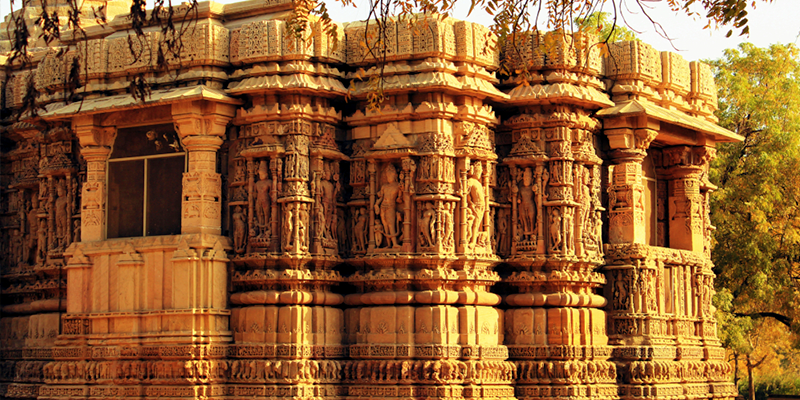 Modhera Sun Temple is one of the Archaeological Survey of India (ASI) protected monuments. Built by king Bhimdev I of Solanki dynasty in the 11 A.D, it is located on the banks of Pushpavati (about 100 KM north of Ahmedabad). The design and architecture of this ancient temple bears a testimony to the superior art and craft that existed way back in the 11th century. Beautiful stone carvings and the deep knowledge of science in architecture are exhibited through the monument. The Sun God image situated inside the main temple received the first rays of the sun, before it was looted by Mahmud of Ghazni. This temple has withstood many earthquakes. There are two tall pillars which seem to disappear into the sky. These pillars have become popular locations for many pre-wedding or model photography campaigns. The recently concluded Modhera Dance Festival (January 20-22, 2017) is held in the temple premises. Garbagruha: Built in the Maru-Gurjara style or Solanki style, the main shrine of the Sun Temple lies in the ‘Garbagruha’ or the sanctum sanctorum. This area is the main foundation of the temple and it sees a special natural phenomenon. From March 20 – September 22, each year, the first rays of the sun falls on an exact location (where the idol of Sun God was once placed). It is said that the idol of Sun God was made with pure gold and showed him riding his chariot. But the golden idol was looted by Mahmud of Gazni in one of his many raids. Mandap: The temple has a huge entrance and the ‘Mandap’ (or the hall). 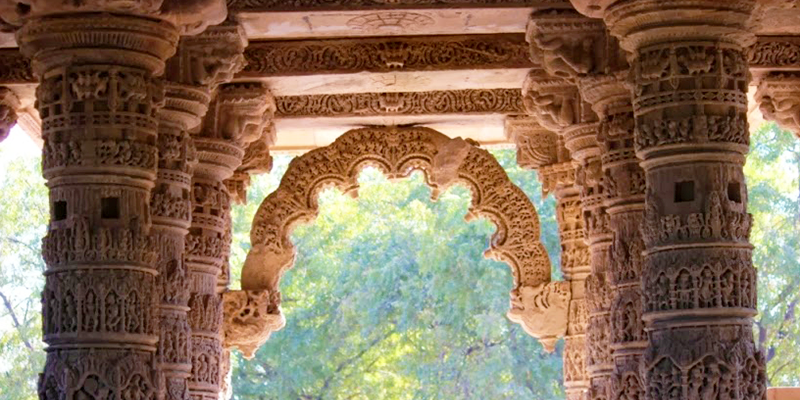 Intricate carvings of Hindu gods & goddesses, birds, beasts and blossoms adorn the pillars and Mandap walls. Sun God is depicted in various forms on the pillars. You can touch and feel these carvings as if just done yesterday! The Surya Kund: A large rectangular water tank in front of the Sun Temple forms the Surya Kund. The Surya Kund replicates a step well, steep with uniquely constructed stairs. There are 108 shrines dedicated to Hindu Gods with three other shrines of Vishnu, Ganesh and Shiva on the three sides. Beautifully sculpted figures can be seen inside the Surya Kund. Visitors are allowed to venture into this steep area till a certain point. There are a few benches on the sides of the Surya Kund, where the visitors may relax and cool off. Archaeology Museum: With time, some precious possessions of the temple had to be removed for safekeeping. Don’t worry such relics can be seen in the museum within the temple premises. There are intricate stone carvings, some of which have been done on monolithic carved stones. There are many rare artefacts on display even outside the museum, such as sculptures carved on multicoloured rocks and stones. The museum is open between 10 AM – 5 PM. Entry fees: Rs. 15 per adult and Rs. 20 Parking fee. Eating: Grab some snacks and beverages at Toran Cafeteria in the temple premise itself. Facility: There are clean and separate restrooms for men and women. 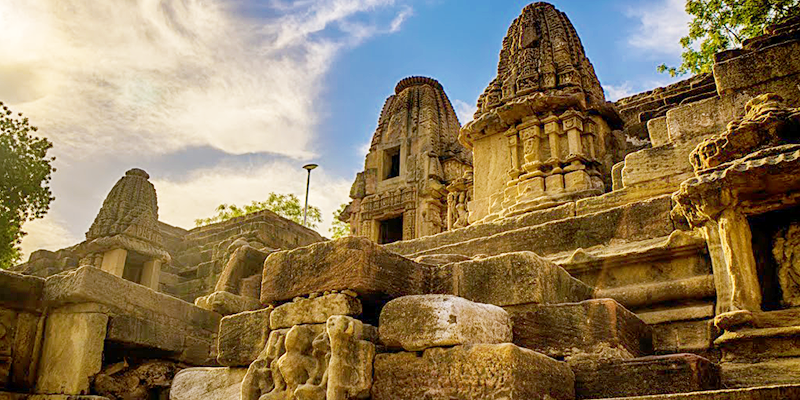 Mahudi: Situated about 60 KM from the Sun Temple on the road towards Ahmedabad, is Mahudi. 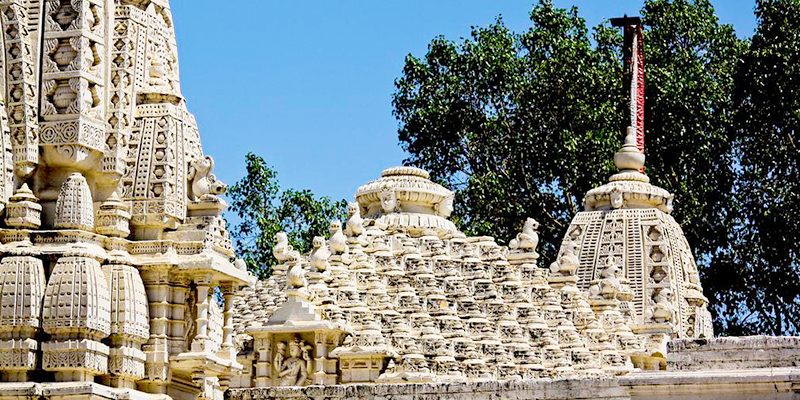 This Jain pilgrimage destination consists of two temples that were re-established in 1917. This temple is famous for its specialty Prasad known as Sukhdi. Sukhdi is a sweet made with jaggery, butter and flour. The sweet is not available elsewhere, as it is mandatory to be eaten within the temple. The temple also consists of a bell, hung 30 ft high. It is believed that ringing this bell fulfils one wish of the devotee. Another highlight of this temple is the famous gold plated idol of the Jain deity, Ghantakarna Mahavir. All through, the temple is decorated with white marble. Becharaji Temple: Constructed by Manaji Gaikwad Sarkar in 1835 AD at Shankhalpur, the present Becharaji Temple is one of the main three Shakti Peeths of Bahucharaji Mata. The Goddess is depicted riding on a rooster. As it is an important religious place for enuchs, 40-50 eunuchs can be spotted everyday in this temple and during fairs more than one lakh eunuchs attend the festival here. The temple remains open between 5 AM to 9 PM. I am very glad to know the glorious history of our country.